I haven't done a What's Cookin' post in FOREVER! I can't believe I let it go for this long...bad blog hostess! However, I'm going to more than make it up to you with today's post, just you wait and see! 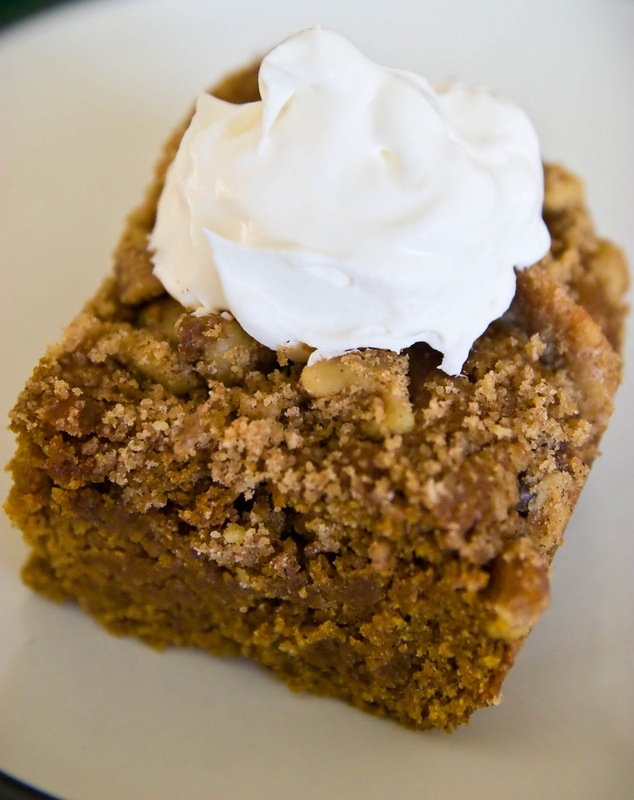 This is one of our favorite autumn recipes, and one that my entire family can't get enough of (what's not to love - cake, pumpkin, streusel...it's a win-win-win all around!). What I love about this cake is that it's virtually foolproof - you can add ingredients (as in, baking SODA instead of powder because you are being distracted by tiny "helpers"), leave ingredients out (I don't love the cloves and go easy on the sugar), or even make your own substitutions (I substitute blackstrap molasses and also use walnuts instead of pecans). Believe me, you CAN NOT MESS THIS UP. It tastes so unbelievably good no matter what you do (or don't do) to it. Other things to note - this recipe is egg and dairy free, which gives it a dense texture that I find absolutely delectable. It's also heavily spiced (but not spicy, just nice and flavorful), and is the perfect recipe for fall when pumpkins are in season. My kids like their cake topped with a tiny bit of whipped cream, but it's just as delicious plain (My favorite is to serve it at breakfast, slightly warmed with a big mug of tea...it's so warm and filling and satisfying!). If you are looking for a last-minute Thanksgiving recipe to make, take, or share - this is the one to try this year. Your guests will thank you for making it! I have made this cake for dinner guests many, many times, and I have yet to come across a person that hasn't absolutely loved it. Even my staunch pumpkin-avoiding friends have told me that this is right up there with the best cakes they have ever had. It's that good! The recipe comes from one of my favorite cookbooks, Veganomicon: The Ultimate Vegan Cookbook , and has been adapted ever so slightly to our family's tastes. Feel free to make your own substitutions (Gluten-Free friends I would love to hear how you adapt this! ), and don't be afraid to experiment. I promise it will taste absolutely delicious. Here we go...I hope you love it! Preheat the oven to 350 °F. Lightly grease a 9 X 13 inch baking pan. In a small bowl, mix together the flour, brown sugar, and spices. Drizzle in the canola oil and mix with your fingertips until crumbs form. Add the chopped nuts and mix. In a large mixing bowl, combine the pumpkin, soy milk, oil, granulated sugar, molasses and vanilla (a great tip for molasses is to spray a spoon with cooking spray before pouring in the molasses - you will avoid sticky spoons and get an accurate measurement every time!). Mix well. Add roughly half the flour, and all of the baking powder, salt, and spices. Mix, using a fork to fold everything together. Add the remaining flour and mix gently until combined. Don't use a hand blender for this, as pumpkin can get gummy if it's mixed too aggressively - blending with a fork helps maintain the texture. Pour the batter into the prepared baking pan and spread it out with a spatula. Scatter the streusel on top as evenly as possible. Bake for 45 to 50 minutes, until a knife inserted through the center comes out clean. Remove from the oven, let cool, and cut into squares. Serve slightly warmed (the microwave is your friend), with optional toppings such as whipped cream or vanilla ice cream. Or serve plain and enjoy the flavors all on their own. Enjoy, and have a wonderful holiday. I'll see you next week!